Click on the map to choose other possible spot. Commonly called beach of GROS, name of the district in which is positioned, it presents waves of different typologies and for all levels. With an average of 1.5 meters, it can reach 4 meters during big swells. Surfable practically every day of the year, paying particular attention to the table of the tides, with more or less good conditions. In case of smooth swells, go out with low tide: the waves will be steep. In case of big swells, better go out with high tide: the waves will do less close-out and you will have more water under the board, in case of wipeouts. In August, in case of apparent absence of waves, remember to wait for the low tide. 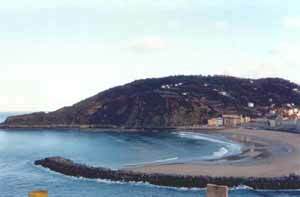 For the most anxious, we advise to go toward the near town of Zarautz or toward Hossegor to check the situation. Gererally crowded but in a good mood. Avoid the right peak to permit to locals to enjoy. CURRENT: from void to strong in base to the dimensions of the waves and the growth or the decrease of the tide. In case of big swells, be careful to the current that pushes toward the open sea present in the side zones of the beach next to the rocks, current exploited by the surfers of middle-high level to arrive directly on the peak without too much paddling.